Twenty races conducted on Monday evenings at 1830 hours except for the first two and final two weeks when the race will start at 1730 hours. Spinnakers are permitted so they make for excellent crew training. 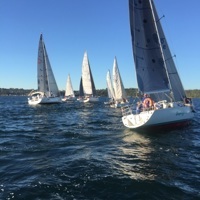 This series also has an IRC handicap for Division 1 competitors. Like the Club Marine Wednesday Twilight Series there is a break over the Christmas Period. A Spring (Races 3-9) and Autumn (Races 11-18) pointscore series of 7 races each will be conducted within the Monday Twilight Series. Competitors competing in the Monday Twilights require a Special Regulations Audit of Category 7.